Beware The Thumb-Devouring Frog of Doom! Hi there, Kotaku friends. Welcome to the hump-day open thread. I hope your respective days have been productive and enjoyable. A story about the intense segregation of St. Louis - This is definitely a thing. An epic NYT op-ed from a Goldman Sachs employee who is quitting the firm - "To put the problem in the simplest terms, the interests of the client continue to be sidelined in the way the firm operates and thinks about making money. " An article questioning the trends in Jazz Journalism and reviewing - Just in case you thought that video game people were the only ones worrying about this stuff. "Flatulence Band Ready to Break Their Silence" - Oh man, I kind of want to respond to this Craigslist want-ad. HBO Cancels Luck after a third horse dies during production - Woah. Man, that is sad. I had wanted to watch that show, and I like horses. Bummer story all around. How to piss off a frog - Yeah, not a shock there. What app is that that he's using? 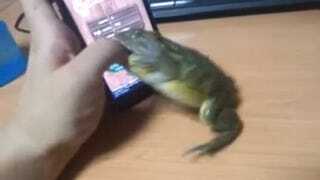 I knew they made games for cats, but not apps for frogs. And that's that. Have good chatting, see you all tomorrow.